Indian Nesphostylis is a perennial climbing herb. Leaves are trifoliate. Stipules are small, channeled. Flowers are borne solitary in leaf axils. Sepals are 5, but upper ones are fused. 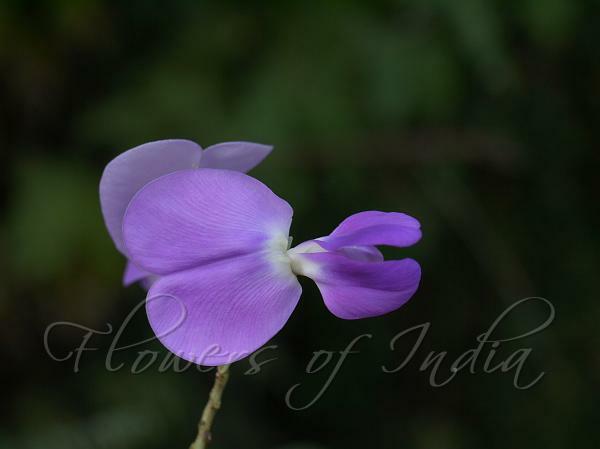 Flowers are large, blue or purple - standard petal is hairless, eared and with appendages at base. Vexillary stamen free, with a tooth-like appendage at base; filaments dilated at apex; anthers similar in size, but 5 basifixed and 5 subdorsifixed. Ovary is linear, many-ovuled, velvety; style slightly twisted, flattening into a wedge shape at apex, with a ring of hairs directly below terminal stigma. Pods are linear, compressed, many-seeded. Photographed at Bhimashankar Wildlife Sanctuary, Maharashtra.